For most people, bed sheets are not just protective coverings for the mattress—it’s also a design or décor statement for the bedroom. Hence, it is easy to get carried away and buy the most stylish and colorful sheets without thinking twice about what they are made of and how they were manufactured. 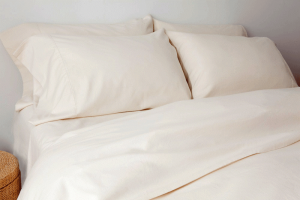 You might not know it, but conventional sheets could be the reason for some of the health problems and allergies you are experiencing. Consider investing in high-quality organic cotton sheets that are made in the USA. If you recently switched to a certified organic mattress, then it’s only right that you also switch o organic cotton sheets. By buying certified organic cotton sheets, you can be sure that you are sleeping on fabrics that are guaranteed 100%organic from the field to the finished product. Many of the best organic cotton sheets are made in the USA and they do not contain any percentage of synthetic recycled fibers. Organic cotton is not only good for you—it is good for the environment, too. And when you buy organic cotton sheets from the right seller, you can be sure that you are giving back to the farmers as well. They feel comfortable and softer against the skin, too, so you do not have to worry about laying on stiff fabric that can chafe your skin. And because organic cotton is grown, harvested, and turned into bedding without harmful chemical treatments, artificial dyes, and pesticides, you get pure sheets that will not emit any toxic fumes and strange odors.